This Irish Red Ale was a recipe I found online with the addition of pumpkin and pumpkin spices for a nice fall beer. A deep rich red in colour (though the picture shows it poorly) this beer has almost no head. The aroma is rich with cinnamon, nutmeg and allspice and the flavour is smooth with a solid addition of pumpkin. The body and carbonation are both medium. Rating: 3.5/5 – A very pleasant pumpkin beer that is great for drinking late in the evening. 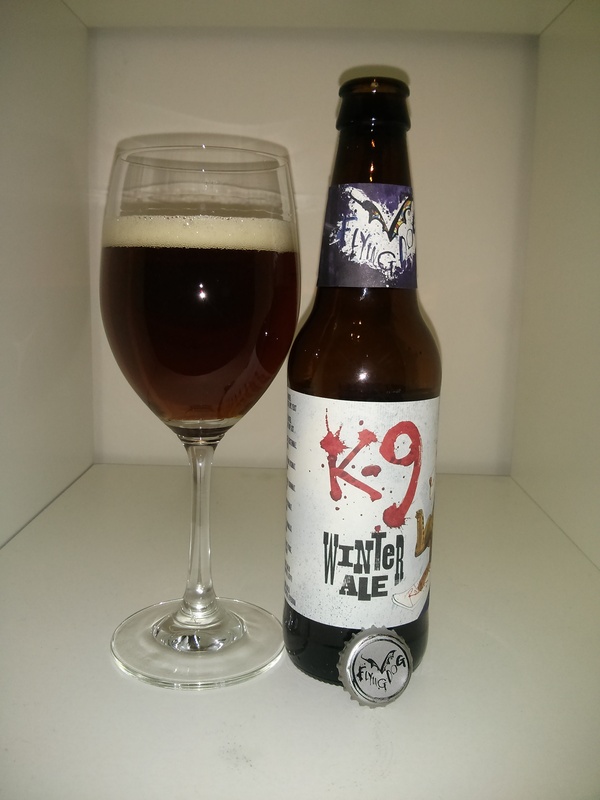 Flying Dog’s K-9 Winter Ale is one of the only ones I also had last year for my calendar, but the beer is different every year. A rich amber colour with a small off-white head that has decent retention the nose is oaky and full of winter spices. 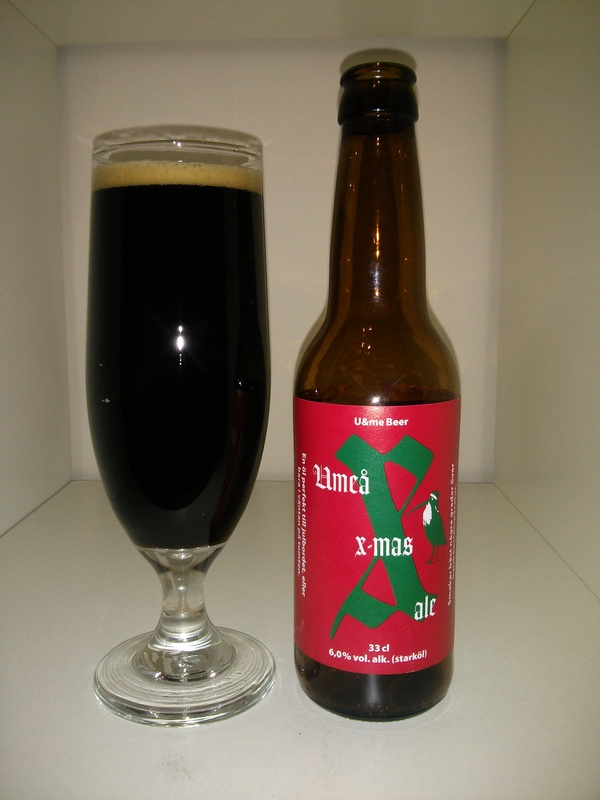 The flavour is also of Christmas spices and has a reasonably thick mouthfeel with medium to low carbonation. Rating: 3/5 – This one isn’t bad but was a little disappointing. I remember last year’s being better. 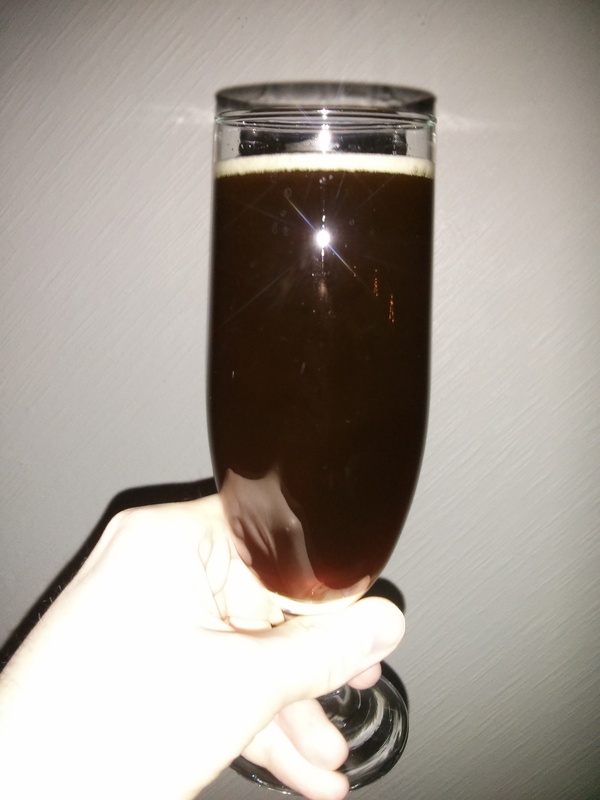 This homebrew is the first all grain brew we made and was mostly a massive learning experience. We since re-did it a week and a half ago and already we can see dramatically different results, but that is for another blog post. 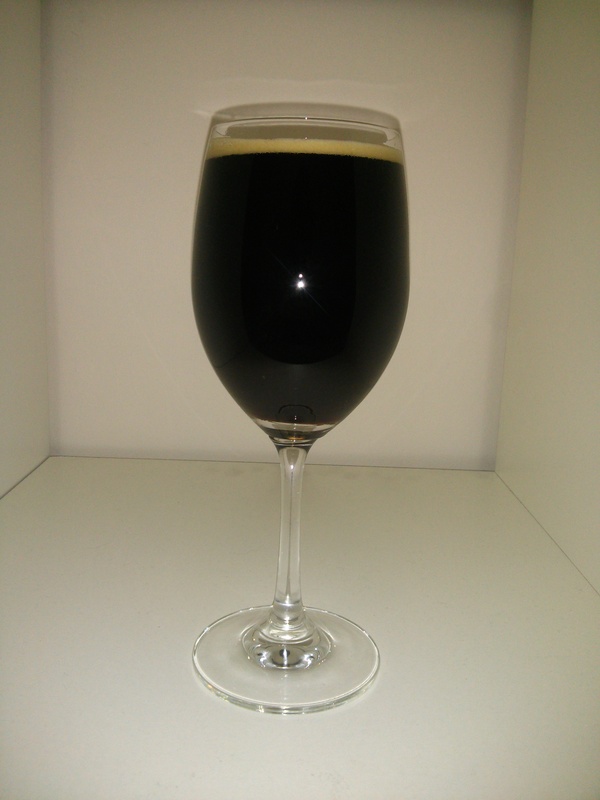 This beer is very dark with an off-white head and has a fruity aroma that carries through strongly to the flavour. 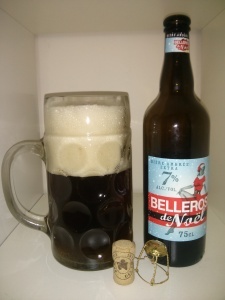 Backed with a strong malty base the alcohol flavour isn’t very well hidden in this beer. The mouthfeel is medium and the carbonation is very low. Rating: 3.5/5 – A decent first attempt at all grain brewing but I’m sure I can only go up from here. 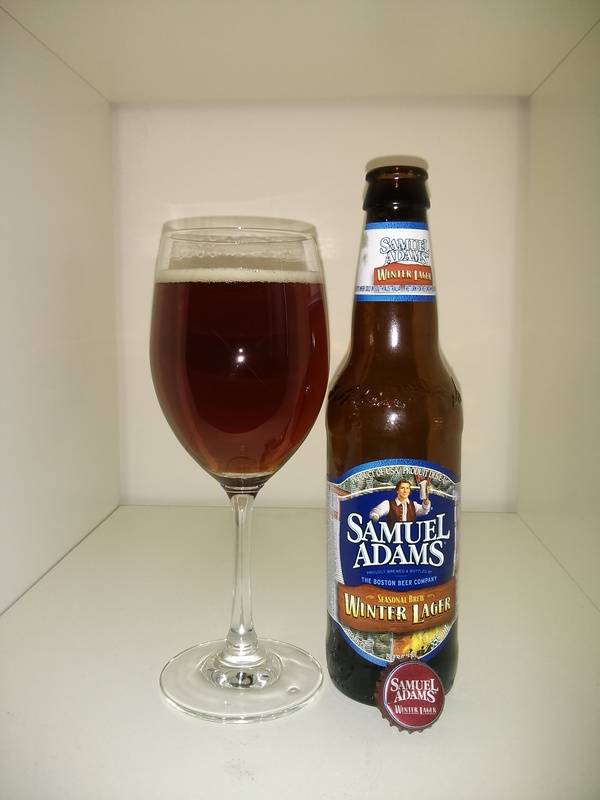 Samuel Adams Winter Lager is not the easy drinking beer you’d expect. It has a reddish-amber colour with a white head that disappeared quickly and is very clear and pretty to look at. The nose is sweet with caramel, toffee, chocolate and hints of apple. The flavour is very malty and sweet with a light chocolate finish. The body is medium to light and carbonation is medium to low. Rating: 3.5/5 – Pleasant and drinkable, something to sip on, not drink quickly like you’d expect from a lager. Thornbridge Brewery’s Smoked Winter Porter is one of the darker beers I’ve had this advent with a chocolatey looking head to it that lasted a few minutes before it disappeared. The aroma has a light smoky smell to it that isn’t overpowering and the taste is of a dry toasted porter with a well balanced smoke flavour throughout. 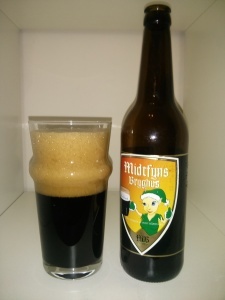 The beer has a medium to heavy body and medium levels of carbonation. Rating: 4/5 – Exactly what I was expecting out of this beer, smoke is well balanced with the toasty malt base, nice and dry. Of the four local craft breweries U&ME was the only one to release a seasonal beer this year with their Umeå x-mas ale. This winter warmer is dark in colour with a coffee head that was small and disappeared quickly. The aroma is sweet like caramel with some chocolate hinted through it. The flavour is a toned down dark chocolate with hints of caramel and also some hop bitterness to balance any sweetness. The mouthfeel is medium and the carbonation of this beer is low. Rating: 3.5/5 – Tasty and bonus points for being local, I’ll drink it again sometime. At 750ml Bellerose de No&#235;l Belgian blonde is by far the largest beer in my calendar this year. Ruby in colour the head is white and lasted short while. The nose is heavy on ginger and other Christmas spices and the flavour is of a fruity sweetness backed by a smooth malt finish. The mouthfeel is medium and there is plenty of carbonation. Rating: 3/5 – Enjoyable but nothing to write home about. Large bottle and fancy cork gives it a bit too much hype. 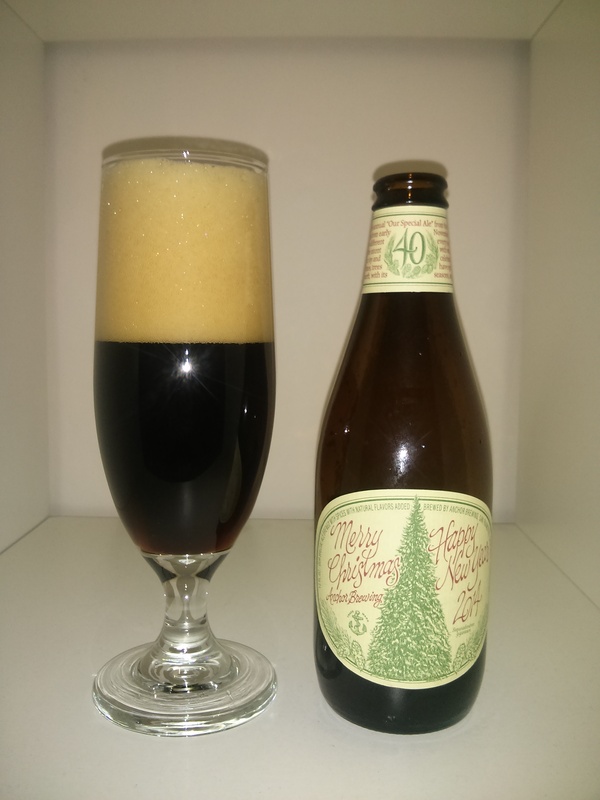 Anchor Brewing Merry Christmas Happy New Year 2014 winter warmer is a well carbonated beer with has a large cream-coloured head that builds quickly and goes away nearly as fast. Very dark in colour (but not quite black) I could smell citrusy hops as soon as I opened the bottle, but upon closer inspection cinnamon, peppermint and other spices became the dominant aroma. The first taste of this beer gave me thoughts of tea, caramel, a hint of fruitiness (thinking dates) and bread which is quickly followed with a sour bite. Mouthfeel isn’t too thick but the carbonation is higher than any other I’ve had this advent season. Rating: 3/5 – If you like sour you’ll enjoy this more than I did, but I’m not big on sour beers and the bit of sourness in the end, while interesting, didn’t do it for me. Probably the coolest thing about Midtfyns Bryghus Jule Stout is that the label actually has braille on it. I don’t think I’ve ever seen that on a label before. Basically black in colour this beer’s head started as a deep coffee colour before fading to a creamy white colour. It was very thick and had fantastic retention, followed by a rich coffee and slightly sweet nose. The mouthfeel of this beer is very thick and has bits of coffee, dark chocolate, caramel and a bit of bitterness to balance it all. The bottle says the beer is spiced with star anise and fennel seeds but as I lack experience with either flavour I was unable to pick them out. Rating: 4.5/5 – Delicious and complex, I look forward to having this one again. Today I’d like to bring some attention to a report the Toronto star brought out recently about the Beer Store (Brewers Retail Inc – BRI) and the LCBO. Basically what the report comes down to is that the Ontario goverment at the time (under premier Mike Harris) forced the LCBO to sign a deal that essentially gives the Beer Store free reign to do what they want without the LCBO getting in its way. Although it was the conservative government that did this, the liberal government has done nothing to change it in the last decade that they’ve been in power. I agree with this wholeheartedly. As noted in the documentary by Mom’n’Hops the Beer Store is a private enterprise that essentially has a monopoly on most beer sales in Ontario, and has full sales statistics to any competitors who choose to sell through them. They also have a stranglehold on the restaurant business, gouging any restaurant that wants to sell beer even more than they gouge the average consumers who buy direct from them. We need a real alternative to the Beer Store, and I don’t just mean let the LCBO sell 12 packs. Lets do something to introduce real competition to the system, to let all the Ontario local breweries have a fair chance to compete in the market and not just for limited LCBO shelf space. Lets do something real with the momentum.